Moosomin town council is inviting the area’s representative on the school board to discuss how the school division plans to accommodate increasing enrolment at McNaughton High School in Moosomin over the long term. McNaughton High has seen increasing enrolments over the last few years, and enrolment is projected to increase by another 100 students over the next three years. 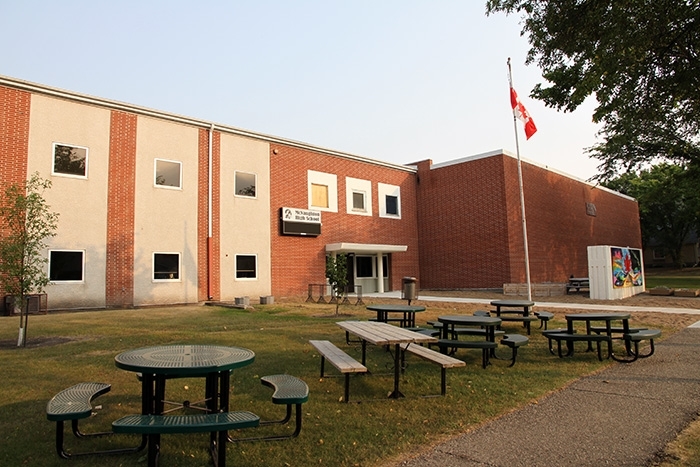 Five portable classrooms have been added at MacLeod Elementary School over the years, and students now leave MacLeod for McNaughton High School after Grade 5 because of a lack of space in the elementary school. Services like the Southeast Regional College Adult Basic Education and satellite education classroom that used to be housed in the high school were relocated from the high school over the years. Initial enrolment in Moosomin schools this fall is 663 students—303 at MacLeod Elementary and 360 at McNaughton High School. The 360 students at McNaughton is already above the projected enrolment of 349 students set in February. Each September for the last several years, McNaughton High has had enrolment above the projected numbers. The projected enrolments for the next three years for McNaughton are 394, 419, and 449—100 more than this year’s enrolment. Because of the projected increases, McNaughton High School is purchasing additional lockers, as it does not have enough in the building to accommodate the projected number of students in future years. “When I see the increases in students they’re projecting, I wonder if there’s anything we can do,” Councillor Ron Fisk said at Wednesday’s council meeting. “Should we start thinking about a new school?” he asked. Carol Flynn, the representative from the Moosomin area on the school board, said the provincial government decides on capital projects for school divisions. “It is all determined by the government and they have criteria,” she said. “The school divisions all have a five year capital plan and we submit every year the priorities that we have as a system as to what our capital project expectations or needs are going to be for the next upcoming years. The government has criteria that they weigh and then they send out everyone a priority list. This one is at number one and this one is at number two and so on. Certainly enrolment is a big part of that. “Right now the high school in Moosomin still has a fair bit of capacity. We’re not to the point where we are looking at capacity as being an issue. There was a time that MacLeod was considered pretty much to be at capacity and then some of the grades switched over. Even more recently there was some concern at MacLeod School that it was over, but the government changed the way they were determining the learning space in a building. She said Moosomin isn’t part of the division’s five-year plan. Flynn said she doesn’t believe there are any capacity issues anywhere in the division right now, but the division’s priority is Weyburn, where $41 million has been spent expanding and renovating Weyburn Comprehensive School to covert it to a Grades 7-12 school. She said that, at the provincial level, the focus seems to be on projects around the province’s largest cities. “Right now certainly areas around Regina and Saskatoon are really getting priority because of increase in enrolment of those areas and you probably have seen that. That is where the new schools are being built and I guess from the government’s perspective that is where they want to put the dollars right now. Flynn said she has been letting division officials know about the growth in Moosomin. “I was just on a conference call meeting and I commented on the growth in Moosomin, and not only in our school but obviously the town. We see lots of businesses coming in. She said planning for school expansion or new schools is a time consuming process. “The sooner you get planning on some of the things you think are going to be needed, the more chance you have of getting something done in a timely fashion, but at the same time it takes years,” she said. “The Weyburn project was in the planning stages for 10 years at least. Even before amalgamation there were discussions about doing some work there. The town of Moosomin invited Flynn to a council meeting to discuss the school division’s plans for accommodating rising student numbers in Moosomin. She will meet with council on Sept. 27.